Skelton squeezes through to first Fish’O final! Round three of Fish’O’Mania headed westwards to the excellent Woodland View complex. A cold and overcast start to the day made the going tough for most, but as the sun gently broke though later on, the carp started to wake up. With a section on Ghost Pool it was predicted the winner would come from here and so it proved, but once more in the competition not from a noted peg. It was Simon Skelton (Dynamite Baits) who drew peg 7 and struggled for three hours of the match putting together a few F1s. However, as the water warmed Simon ventured down his edge once more, where it turned out to be solid with carp. Feeding micro pellet and fishing expander pellet over the top bought a succession of carp up to 8lb and his weight of 114-0 was enough to see him through to this year’s final. Simon commented “Fish’O is the one final I really wanted to get in as it’s such a prestigious event to be in and it’s a dream come true. I feel so blessed”. Jack Danby (Dynamite Baits) wasn’t too far behind again, as he finished the day with 108-10. Jack was on High Pool where the rest of the framers came from, sat on peg 12 he fished caster up in the water on long pole to catch F1s and carp up to 8lb. John Whincup (Frenzee/Baitech) rounded out the top three on peg 31, where he too caught shallow and long but on pellets for 101-0. In the end the Woodland View fished really well, despite the slow start, with some good weights being recorded all over the venue. 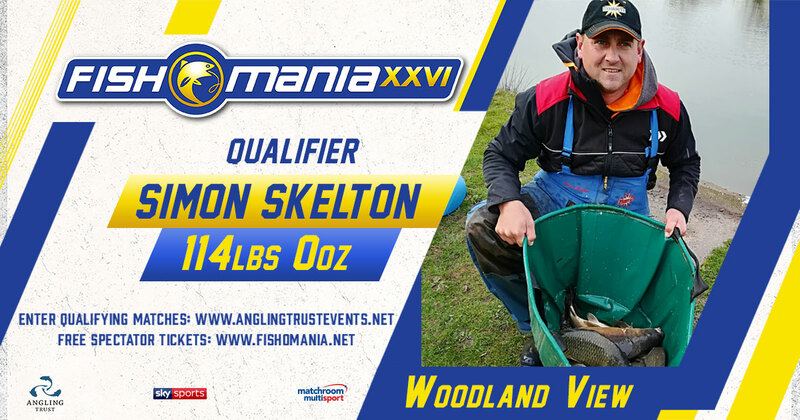 The Angling Trust would like to thank Mike, Denise, Adrian and all the team at Woodland View for their help and assistance on the day and to Andre Grandjean for stepping to host a well-run qualifier. We stay in the west of the country for the next qualifier at Moorlands Farm and with venues starting to sell out make sure you visit the booking site to guarantee a ticket. Tickets for the Fish’O’Mania XXVI qualifiers will again be sold via the Angling Trust events booking website. Ticket prices have once more remained the same at £25 per qualifier. Female FishO Qualifier just around the corner! Fish’O’Mania Qualifying Tickets Selling Fast! Get your FREE spectator tickets for the Fish'O'Mania XXV Grand Final at Hayfield Lakes now from www.fishomania.net. Download & print at home or order your tickets for postal delivery. Tickets are free of charge, £5 car parking fee applicable on the day.